September 29 is shaping up to be an interesting day for Android fans. That's when Google should announce the Nexus 5X and Nexus 6P, and also when HTC is expected to unveil a new One smartphone. Initially known as HTC Aero, the new HTC-made handset should be released as the One A9. Right now, details about the HTC One A9 are conflicting, but the latest rumors have it that the smartphone will not be a high-end one. In any case, thanks to @evleaks, we can now take a look at what seem to be the color variants of the One A9: acid gold, opal silver, deep garnet, carbon gray, rose gold, and cast iron. Reportedly, the HTC One A9 is 7mm-thin, and sports a 5-inch display with 1080 x 1920 pixels. The smartphone might also feature an octa-core Qualcomm Snapdragon 617 processor, a 13 MP rear camera, 4 MP UltraPixel front-facing camera, 2 GB of RAM, 16 GB of expandable storage space, and a 2150 mAh battery. A fingerprint scanner should be included, too (in the home button that's visible on the front of the handset). 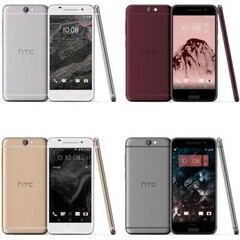 Take a look at the HTC One A9 in the slideshow below (besides the new images showing the phone's color options, you can see a few older photos of the handset in the wild). Do you like what you're seeing? HTC is just wasting their money and resources, they keep risking themselves. I know this is to compete with the high end mid range like Xperia M5, Galaxy A8, Huawei G8 etc., but what makes them think that they can compete in that kind of market? Why not just focus more on their next flagship? It looks decent, but idk why HTC is wasting money like this. They're becoming the replacement for Blackberry's former spot. Tada! Thank you, Apple for introducing "Rose Gold"? Rose gold has been around long before Apple added it to their color palette. "Rose gold, also known as pink gold and red gold, was popular in Russia at the beginning of the nineteenth century"
Same like gold, which has been around for long. But who makes it popular til every flagship now comes with gold colour? It's Apple when they release 5s. The same thing goes to fingerprint sensor, yes Apple not the first, but who makes it popular ? It's Apple iPhone 5s. Look at S5, S6, whatever nexus that is going to release later and blah blah blah. Making it popular and introducing are two different things. They didn't create the Rose Gold color, they simply offered their phone in that color. What is so groundbreaking about that? What they did wasn't much different than what couples do everyday when they pick out a color swatch for their den or bedroom. http://m.ebay.com/itm/HTC-ONE-E9-Plus-Rose-Gold-Dual-Sim-FACTORY-UNLOCKED-5-5-1440-x-2560-32GB-/221775389272 Earlier this year http://www.samsung.com/us/mobile/cell-phones/SM-N900VWDEVZW 2 years before Apple. http://m.ebay.com/itm/UNLOCKED-docomo-F-12C-Fujitsu-WATERPROOF-Smartphone-Color-Rose-Gold-/261405311198 4 years before Apple. Those Rose Gold shades are actually more appealing imo. They look more copperish gold which is what I think the 6s should've gone for. Maybe it is, but from the videos and photos the 6s is way too pink. The sheep still won't believe you. Haha! Y'all funny, guys. Yep, we know some Android manufacturers did it first but damn Apple sure does get attention and they immediately follow. From fingerprint scanner, 64-bit, gold and rose gold options. Real competition. Which Android phone was 64-bit before the iPhone 5s? Lol and u thought if apple didn't do 64bit it would never happen?? Maybe because you guys treat everything Apple does as if they did it first and it's magical. I'm sorry but I'd never go nuts over the color of a smartphone. No. No. They didn't do it first but they make other manufacturers do the things what they highlight on their iDevices. It's amazing you know. Exactly, because you guys are like a bunch of cheerleaders for them. They put a smaller battery in their device this year compared to previous. When that's happened in an Android device, people go ape on them. With you Apple users, oh well. Apparently for most of you whatever they do, good or bad, your reactions range from "It's the greatest thing ever" to "Oh well, would've been nice, maybe next year". The difference is Android users seem more likely to call OEMS when they think they did something wrong. Might have to do with the fact that there isn't only one OEM to be loyal to. That bottom bezel just killed the phone.. omg..
No, apple is htc like. No That Huge Bottom Bezel Is Apple Like, Cause That Is What I Was Referring To, Not The Design As A Whole, Which is Pure HTC. Even bigger than iphone imo..
Is this seriously suppose to be their savior phone that's going to make them rise from the ashes? I was excepting a whole new re-design and something radical like when they introduced the One M7. I wish HTC luck, but this isn't going to cut it. To be fair, the radical design of the M7 didn't work. It was an okay start but they screwed up any momentum they had from the M8. So trying it again would have been suicide. I honestly don't mind this approach from a business stand point. It seems to be working for Xiaomi and Meizu.